Refreshing and cooling mint and sweet woody fragrance of white tea when combined help to create a very soothing, cooling and relaxing atmosphere. 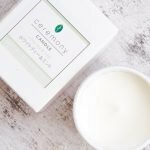 Ceremony White Tea & Mint aromatherapy candles are made with eco-friendly and sustainable soy wax. The candles are infused with high-quality White Tea and Mint essential oils that perfume the space long after the candle has been put out. Mint is known to be a stress buster, it helps in reducing inflammation and is excellent for headaches and de-stressing. It is also used in aromatherapy to help with nausea, menstrual cramps, fever and breathing problems. The slow burning and long lasting Luxury candles come in beautiful glass containers. Each 100 gram candle burns for a minimum of 23 hours releasing their soothing and stress relieving aroma continuously as they burn. Refreshing and cooling mint and sweet woody fragrance of white tea when combined help to create a very soothing, cooling and relaxing atmosphere. Ceremony White Tea & Mint aromatherapy candles are made with eco-friendly and sustainable soy wax.